Home » Interesting Discussions » Your Say: What is one beauty don’t that you do? I’m perfectly guilty of popping pimples and squeezing blackheads – I try to resist but sometimes, you know how you look in the mirror and all you can see is that giant blackhead or pimple staring back at you daring you to squeeze it? I give in right about then. Your Say: What is one beauty don’t do you do anyway because you just can’t help it? Squeezing out the blackheads is something I can’t resist and do it quite often..haha..Next comes spicy and fried foods…. someting I always give in to….hopeless. Haha yeah what to do eh? Some spots are too good to resist popping! It’s also taken me years to stop popping my zits. I have a strawberry nose, so sad…other than plucking them, I have no idea how to remove them. I have been trying various products but to no avail. I love squeezing pimples! But so far i’ve been lucky there are no major scars. I felt cleaner after i pop it. if i leave it alone i am worried it will stay “dirty” even after it dried up. What do you think? I don’t get many these days *touch wood* but when I do see a ripe spot, I pop. If its cystic I usually try not to touch it as that usually makes it worse. Once in a blue moon, I’ll go to bed without taking off my makeup–sacrilege, I know! something to share. I am taking chinese medicine course. According to my sifu, our body is very special, it will auto-react, eg when we feel sleepy, we tend to take sour stuff to stay awake, as proper sour intake is good for liver. sweetness corresponding to stomach. salty to kidney. if we auto-respond to salty food, means kidney is ‘asking for help’. but giving lot’s of salt is not a good solution. but, i think i need to ask my sifu, wat drives us to love fried food so much! anyway, just something to share. I try not to squeeze pimples but sometimes they cone out of their own, especially when I wash my face. I don’t believe in the toner rule anyway, more partial to the Japanese lotion instead. Sometimes I wonder if all these different types of skin are nothing more than a marketing poly for variations of normal skin. Like these categories only arose with the advent of estee lauded and Helena rubenstein, when they were building their dkincare/cosmetics empire =P I think that I’m just bitter that all those years of using acne prone and oily skin products have just left me with more oily skin that is dehydrated on the surface. I don’t even get the sole advantage of oily skin, which is less wrinkles as time pass by D: Just using intensive moisturizers and serums to try to replenish my surface moisture now. I apologize for all the typos. Curse you auto correct on the iPhone! Ahem – are you sure they come out on their own? 😉 Actually I think extracting blackheads is better done after a warm shower anyway. At least our pores are open and relaxed and they are easier to pop (and possibly leaves less scars too?) I don’t do toner either. Haven’t used a western style toner (meant for clarifying) for years 😀 I think every brand has something to sell – even the Japanese 😉 We just have to work with whatever suits us better. 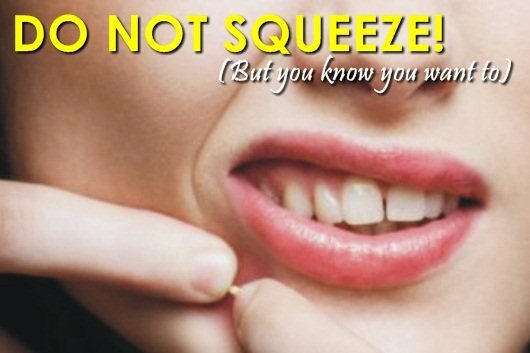 hmm….squeezing pimples too!!! hahahah well, also…not applying body lotion on a daily basis ! I should due to my very dry skin condition! oh, i have a few and like you i can’t resist popping pimples! i am also guilty of eating salty foods! waaahhh….i also sleep late!!! oh no! i have so many beauty don’ts that i do….